Can you believe this is my fifth holiday season? My first was in 2014 when I was just 9 months old, so I thought I would take a look back. That was one year we didn’t have a tree, but there was lots of other stuff going on! 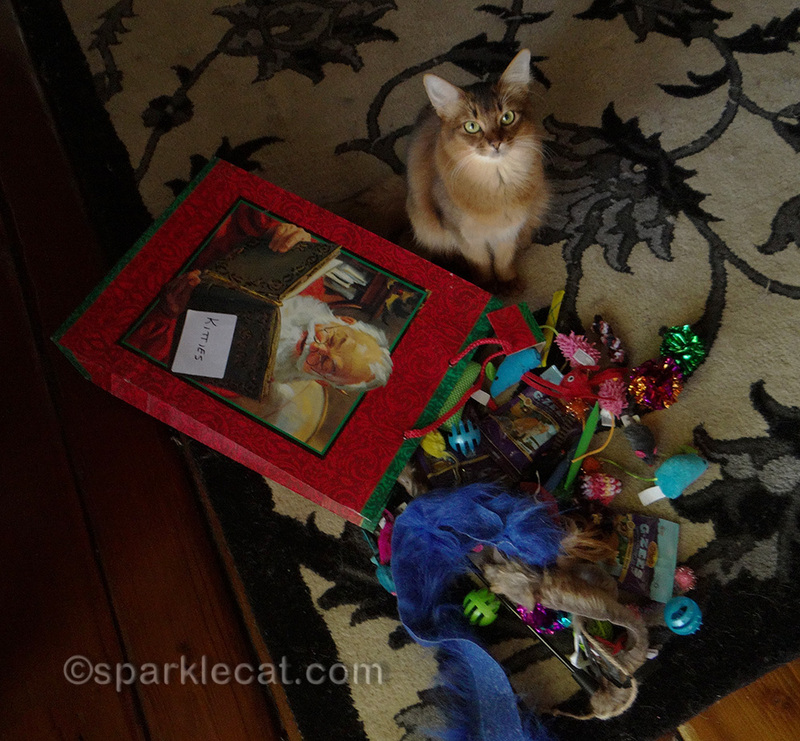 That year, I had the Santa Kitty Toy Hop! 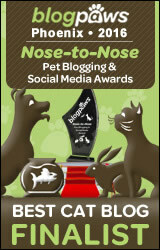 I decided to have an event where blogging kitties put together a bunch of toys and gifts for their local shelters. It was a nice success and lots of fun! I should do that again. Maybe next year! I was still competing in cat shows back then. In fact, I had just begun competing as an altered adult cat. There was a fun Christmas show I went to, and I had several finals. In fact, I got a Best Longhaired Alter and a Best Allbreed Alter that show! I was also starting to do photo shoots, like this one with Binga. Except one of us seems to be having a wardrobe malfunction. Even back then, I did better posing by myself! Aww… I luved seeing those photos, as I wasn’t in the blogging world back then. Your Santa Kitty Toy Hop sounds fun. You totally should do it next year. Mom and I put together a small bag of toys and things for my fav shelter a couple of months ago. They really appreciated it. Purr purr purr. My Human remembers that Christmas! You were so small! This is my Second Christmas and it is different than last year. I also went on my first road trip this last weekend! It was not as bad as I thought it might be. And Binga is Binga! She does love to Photobomb! Flashbacks sure are fun, aren’t they?! Loved seeing you with Binga…At first I thought that hat was a scarf, OMC!! MOL! You were a natural at posing from an early age. 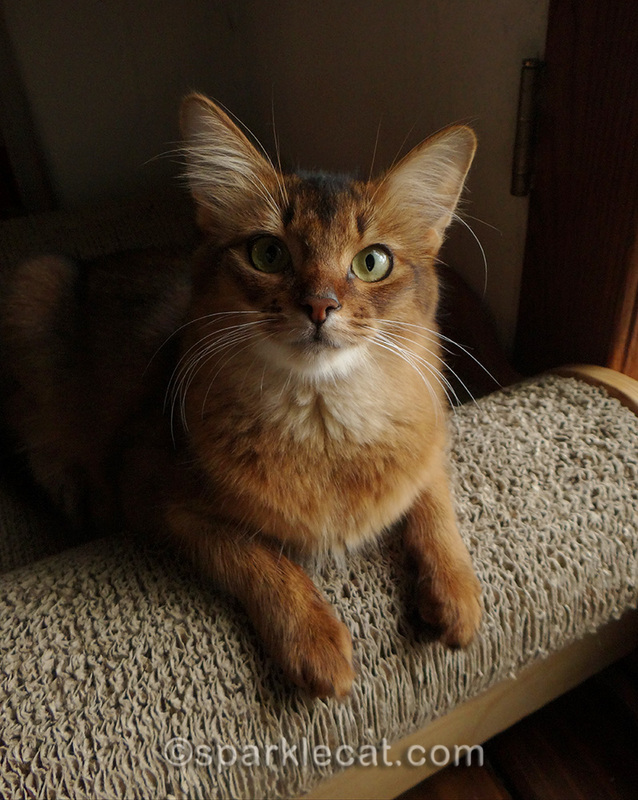 You were such a cute kitten and you are now a gorgeous grown-up. 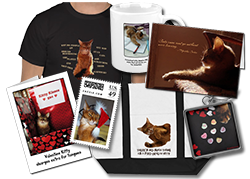 As for Binga, she is Binga and we love her no matter what! We canâ€™t believe itâ€™s your 5th Christmas! Wow! You were as pretty then as you are meow. You were a cute little kitty. 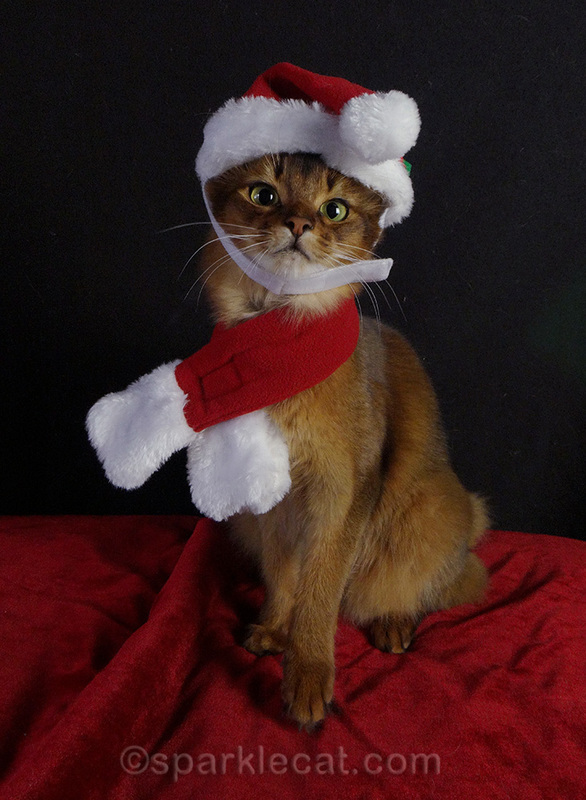 I remember your Santa Kitty Toy Hop. I got a kick out of Binga’s wardrobe malfunction. It was to flashback to your first Christmas, Summer. Sweet flashback, Summer! And we like Binga’s hat wearing! 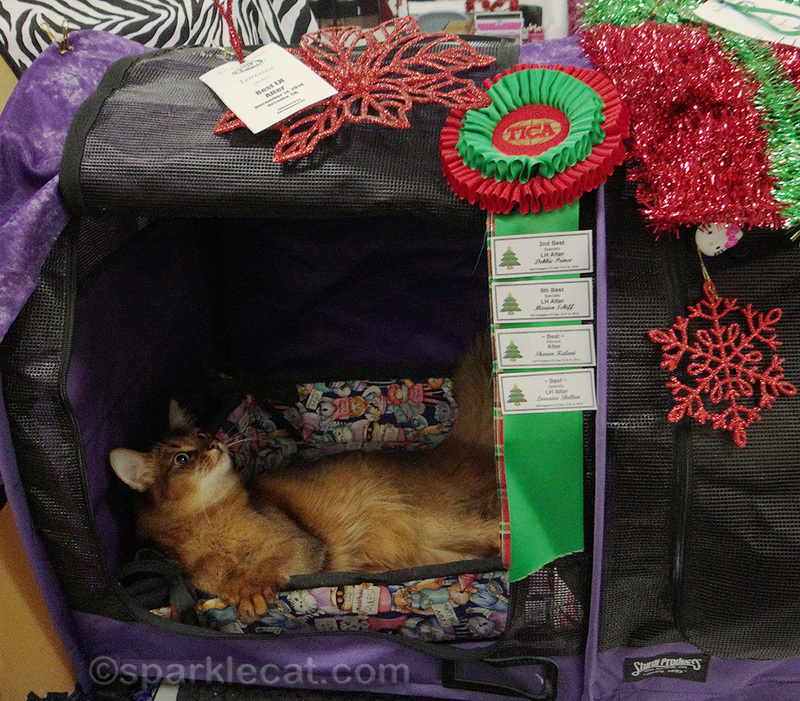 I remember the Santa Kitty Toy Hop! We should definitely do it again. You were cute back then, but I think you get cuter every day. Summer, I remember that toy drive. I’m donating food this Christmas to UCFCC. Dorian is doing a cool toy drive this year. We had just started blogging around this time in 2014. How time flies! And now you’re all grown up! Awww, so nice to see the early days. 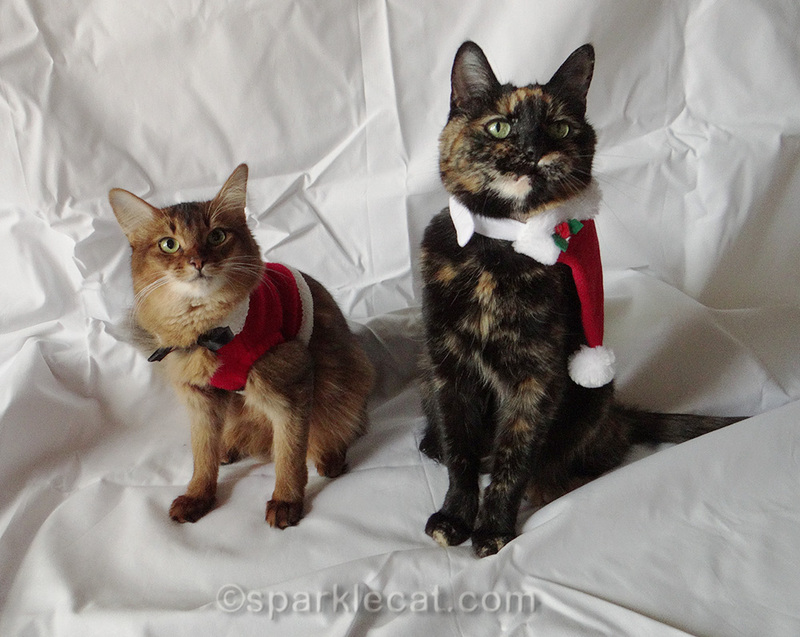 Binga did try but maybe being santa wasn’t really in her heart? Well done Summer, even at that young age. Binga, you are looking mighty good there too. You were, and still are, a very cute kitty! You were such a cute kitten. Now look how grown up you are! Summer, you’ve always rocked the modeling routine! That was a really fun flashback sweet Summer! Oh I love that last photo! MOL we ALWAYS have wardrobe malfunctions! Fun flashback. Cute as a kitten, even prettier as an adult! Thanks for the flashback. Youâ€™ve always been a star. Love Bingaâ€™s wardrobe malfunction.